When Kerry Pierce shared with us that she planned to have a miniature Interlake vessel atop her grad cap this spring, we had to find out more about what was driving this 23-year-old’s passion for Lakers. Tell us about your grad cap: what inspired you and how’d you make it? This grad cap actually isn't the first time I've worn a laker on my head, believe it or not! Back in 2015, I constructed a large front half of a freighter out of craft foam and a baseball cap to wear to the Lake Superior State University hockey games. 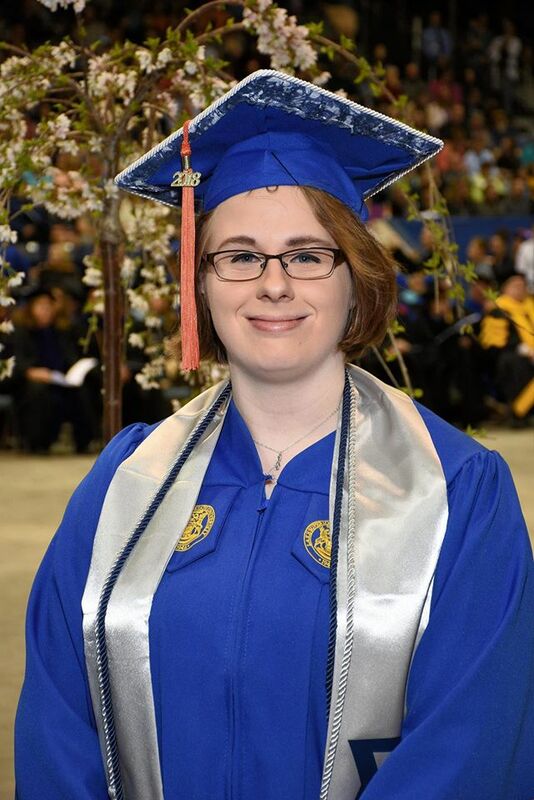 I became sorta famous on campus for proudly wearing my ship hat all the time, and it felt natural to bring that with me all the way to graduation, too! 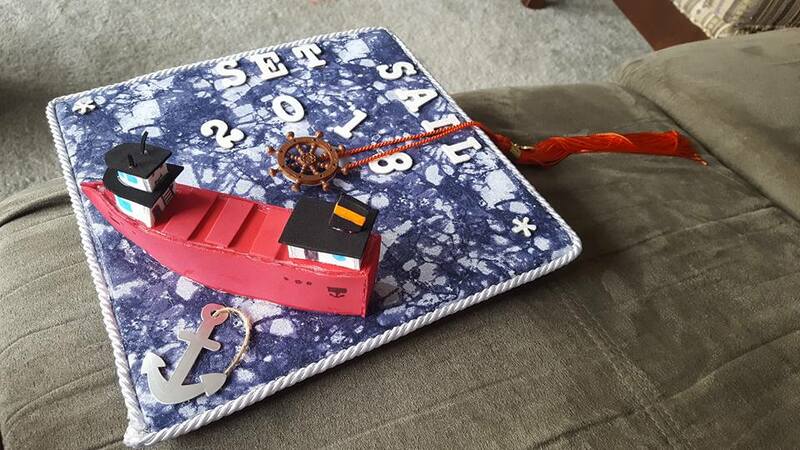 So I decided to replicate the idea in a more practical way with a smaller ship on my grad cap, this time being an Interlake vessel as a nod toward the ship that began my interest in the whole shipping industry -- the Lee A. Tregurtha. It probably took me about 5 hours of nonstop work to complete. I used a fabric overlay on the cap to replicate the appearance of the ice thawing on the lakes in the early spring season, white rope trim, craft foam for the laker, and scrapbooking stickers. How did you become such a big fan of the Lakers? It all started back in 2012, when I was on a trip across Michigan's Upper Peninsula with my family to tour a few potential colleges. 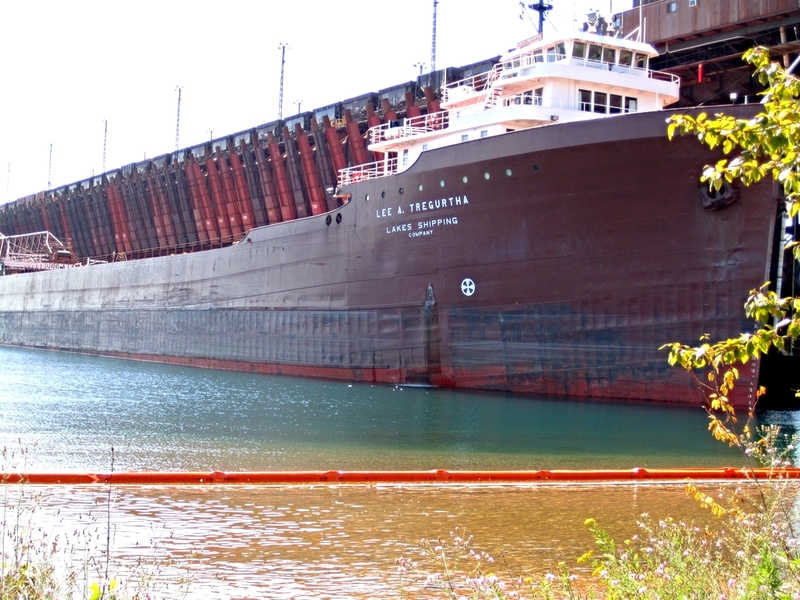 We had stopped at a park in Marquette, and anchored right there at the dock was the Lee A. Tregurtha. Being from the Ann Arbor area, I hadn't seen very many ships at all growing up, nor did I spend much time by the water. I'm also a geek for any sort of machine, having been in my high school's robotics club and searching for engineering programs at colleges. I was in awe; towering over me was one of the largest and most elegant machines I'd ever seen in my life! I took out my bright pink camera and snapped my very first photo of a laker, the beginning of a new hobby I've fostered ever since I moved to the Soo. Over the years, I've spent many afternoons and evenings tracking various vessels on MarineTraffic just so that I could go see them and take pictures. I have a special appreciation for Interlake not just because of my first encounter, but because this fleet takes special measures to ensure its ships have lower emissions and environmental impacts, and Interlake is invested in educating the public about the importance of the shipping industry at events like Engineer's Day. What are your career plans? Any chance we could we see you in the shipping industry one day? I officially graduate in December 2018, but LSSU only hosts one commencement ceremony per year so I walked early. I am completing a BS in Computer Engineering. I am not 100% certain on where I'd like to end up, but some part of me still dreams of doing something related to the shipping industry, whether it's in designing onboard systems or taking a more hands-on career path. I'll admit -- I did some extensive research into what it would take to make a career in sailing the Great Lakes. At this moment I don't think it's quite feasible for me to pursue that, but perhaps in a couple of years; we'll see where the currents sweep me!